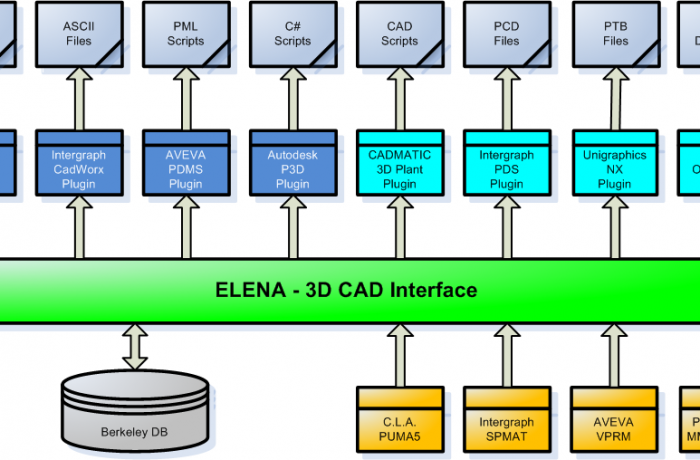 ELENA (3D CAD Interface manager) is an infrastructure project management software engineered for companies working in the industrial plant market (EPC Contractors and Owner Operators). It is an independent software platform whose main function is integrating heterogeneous 3D CAD systems with heterogeneous Material Management Systems (MMS). Thanks to a completely automated process, ELENA can produce the components catalogue complete with the dimensional data, the piping specs and the accessories tables which are needed by 3D modelers in order to be ready for modeling. According to ELENA workflow, the CAD department owns full control over their key data relating to any piping element of the project. The application has a fully configurable data model, making ELENA flexible and adjustable to any specific needs of the projects; it also lets users manage different 3D modeling systems simultaneously from a single material management system. ELENA guarantees independence from the suppliers of material management systems and from the suppliers of 3D modeling systems, thus representing the linking point between the key software applications used for plant engineering and, in particular, between material management systems and 3D modelers.